Watch the short video below to find out more about how the Sage 50 Payroll Pensions Module which is an add-on module to the Sage 50 Payroll Auto Enrolment Edition can help your business. With the module complex legislation is made simple. Let the Pensions Module do the hard work for you. 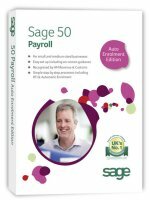 To see the other Sage 50 Payroll videos click here. Order the Sage 50 Payroll Pensions Module online here or call your Sage Accountant Partner, Site4, on 01257 460018 to order today.